Winnie the Pooh would spend every day of life humming tunes and stopping frequently to eat "a little something." But today, Pooh and Piglet have to find the Heffalump, watch Rabbit scheme to rid the forest of Kanga's dreaded bathtub, and help Eeyore search for his tail. Pooh's intentions are always the best, but his passion for honey and condensed milk keeps getting him into trouble. "...Oh bother! 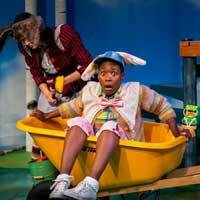 Adventure Theatre is currently presenting a hunny of a show with Le Clanché du Rand's delightful stage adaptation of A.A. Milne's Winnie the Pooh. Under the fine direction of Shirley Serotsky, Milne's 100 Acre Wood and its inhabitants magically come to life with a story of lost tales, huffalumps, and much more." "...Adventure Theatre MTC is dedicated to educating and inspiring new generations of theatre artists and audiences, and productions such as “Winnie the Pooh” does a phenomenal job of doing just that for the youngest patrons. Seize the opportunity to cultivate an early love of theatre in your littlest ones by taking them on a trip to Hundred Acre Wood with “Winnie the Pooh” at Adventure Theatre MTC." "...This show skews on the young side-noted by the 8-9 year-old behind me who declared he was not really into it. But, all the littles seemed glued, and my own 3-year-old guest declared her approval at the end, saying she liked it, clapping at all the right moments, and staying fully awake the whole show. It gets funny for the adults about half way through, when the Jamaican Owl shows up, Piglet takes on some gumption to great affect, and Eeyore expresses pure delight (with his customary ho-hum tone) at his destroyed birthday present."